Place 1 pint of cherry tomatoes on a baking sheet and season with 1 tablespoon of olive oil and salt. Roast for 20 minutes. Remove and let sit. Toast 1 piece of 12 grain or multigrain bread. Remove and promptly spread 1 tablespoon of goat cheese on toast. 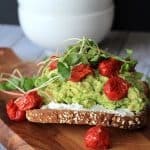 Top with 1 mashed avocado, 1/4 cup of roasted tomatoes, and a 1/2 cup of buckwheat sprouts.